Basil's Blog: So exactly what was in the balloon? The whole world -- or at least the part of the world that had nothing better to do -- was transfixed Thursday by the saga of the boy in the balloon. 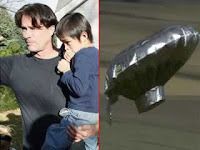 First reports said that 6-year-old Falcon Heenes was on board the balloon, and people were horrified at that prospect. When the balloon landed, and the boy wasn't found, first fears were that he had fallen out. When he was found hiding in an attic, speculation turned to the whole thing being a hoax. But there's one aspect that people are forgetting: since Falcon was not on the balloon, what was? Many are assuming that it empty. But was it? Remember that the investigators said they believed the family when they said the boy was on the balloon. Then they believed the family when they said this wasn't a hoax. They also believed the family's timeline of events, such as calling 911 when other reports say they first called news outlets. Now, on Saturday, they're thinking they might need to check out this Heenes family. Joe Friday and Bill Gannon these guys aren't. So, I'm wondering... did these investigators even check out what was in the balloon? Or did they simply say, "Hmm, kid's not here" and let it go at that. Was something else in that balloon? And, if so, what? It's hard to tell how much stuff could be hidden in the balloon, so I'm not sure how many of these items, or what else could have been on board.